GDP figure for the United States came in with an underwhelming thud last week just as inflation has been creeping up. Research by the Dallas FED has maintained that core inflation remains within control while FED Chairman Ben Bernanke has argued that headline inflation is transitory. The recent down tick in unemployment (Exhibit 1)--which is welcome news given the FED's dual mandate of price stability and full employment-- is just as likely to be a result of decreasing labour market participation as it is from actual growth in employment when viewed in hindsight. North of the 49th parallel, and arguably in subtle contrast to the FED's position, the Bank of Canada, in its April 2011 Monetary Policy Report, has stated that robust demand from emerging market economies combined with the commodity supply shocks of rocketing fuel and food prices are creating global inflationary pressures that will have a strong direct channel into core CPI. The nuance in the BOC's argument is in the reaction of consumers: it is understood that commodity prices act as a tax on consumer behaviour -- take gasoline as an example -- but consumer behaviour will only change once prices are perceived to be persistent wherein a substitution effect takes place (e.g. purchasing a hybrid vehicle as opposed to a gas guzzling SUV). But substitution effects are only likely with appropriate expenditures -- most consumers do not have the requisite liquidity to make durable goods expenditures with turns in the business cycle -- and such expenditures are dependent on access to credit. David Powell, an economist at Bloomberg, came out with some figures showing that (before tax) prices of gasoline (in USD) at $3.73 for the year would entail $667 more on fuel expeditures for the average American than in 2010. When that figure is increased to $4.00/gallon it entails $885 more spent on fuel. Do American's have the access to credit to make a change in light of such a persistent scenario? 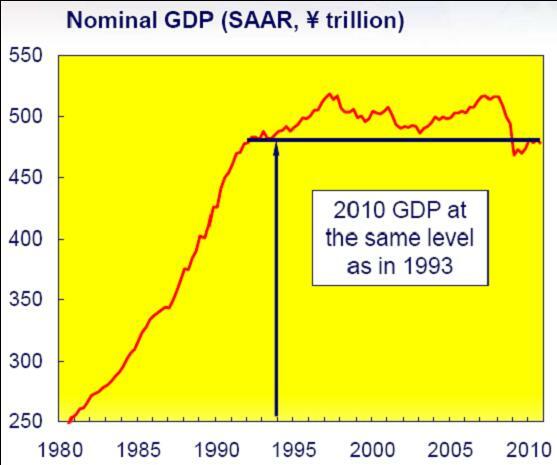 So what does this portend for economic growth? Leading indicators (Exhibit 2 & 3) and financial conditions (Exhibit 3) are improving and make a case for better times ahead but the challenge will be complex and such indicators are only of use when they are persistent and pervasive. 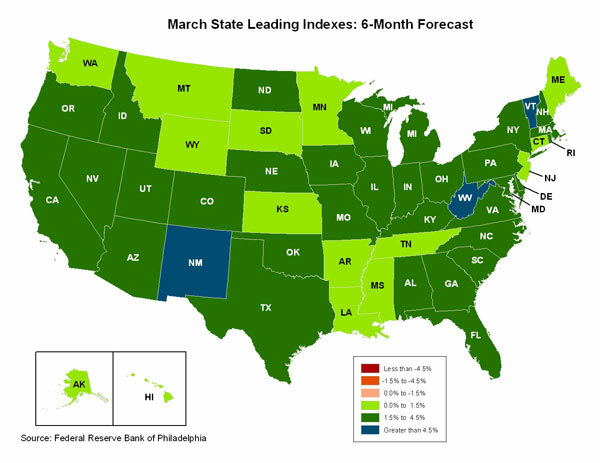 To further complicate the situation, consider that stagflation in the United States is now on the radar as a possibility: research by the San Francisco FED (Exhibit 4) has argued that the NAIRU is now probably appreciably higher than before. 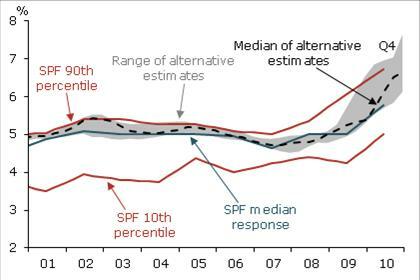 Of course, the criticism of such analysis rests on the notion that there even should be a "natural rate" of unemployment but then the point of this post isn't to attack the edifice of neoclassical economic analysis. The case has been made in previous postings that (in my opinion) we should expect a return to old fashioned business cycles and hard landings with the absorption of labour in the globalized economy. For two decades, this labour from the emerging markets was instrumental in the ascendancy of Wall Mart to becoming the world's largest retailer; instrumental in keeping a lid on inflation; and a cornerstone to the myth that a subscription to a rules based approach to monetary policy was all important as exemplified by what is now termed the Great Moderation. History will show this to be false. Short of the discovery of a breakthrough technology that will make the reliance on oil obsolete, the demand for oil and its derivatives will continue to rise as will the supply shocks to global economies. Is Sustainable Domestic Growth Possible? Yes, if the fuel for the Ponzi economy in the West, namely access to credit, is maintained. If not, then we should expect sub trend growth in the coming decades. 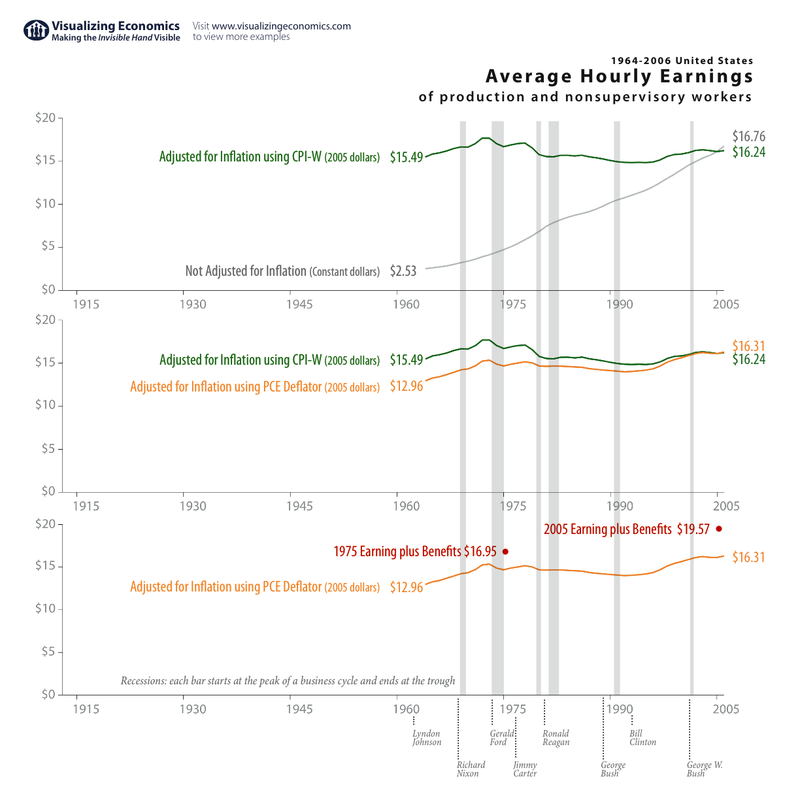 The vast majority of the population cannot afford the lifestyles they aspire to; this is particularly evident in the aftermath of the Great Recession. 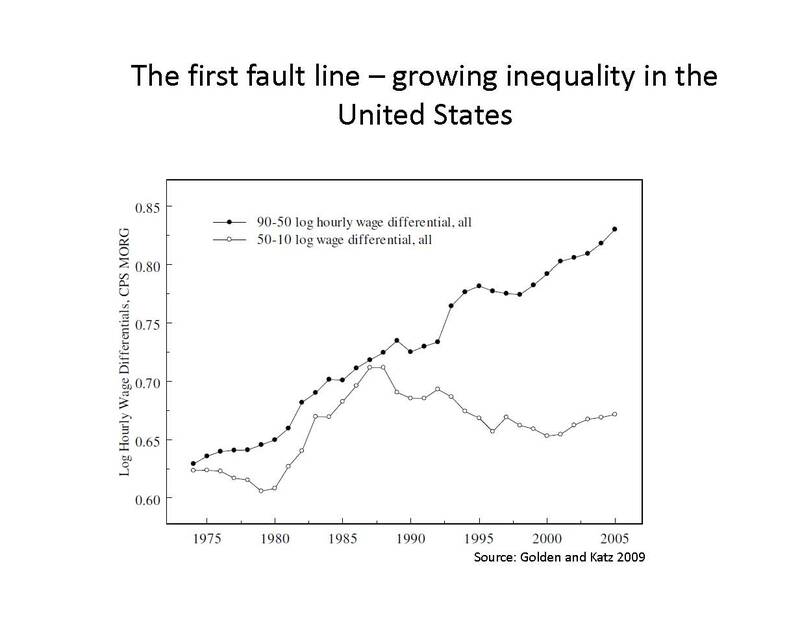 Looking at this from the vantage point of two extremes in the political spectrum: Raghuram Rajan, a former Chief Economist for the IMF and now a faculty member at University of Chicago's Booth School (see Exhibit 6); and Marxist scholar Rick Wolff (see Exhibit 7) we see agreement on one observation: inequality. 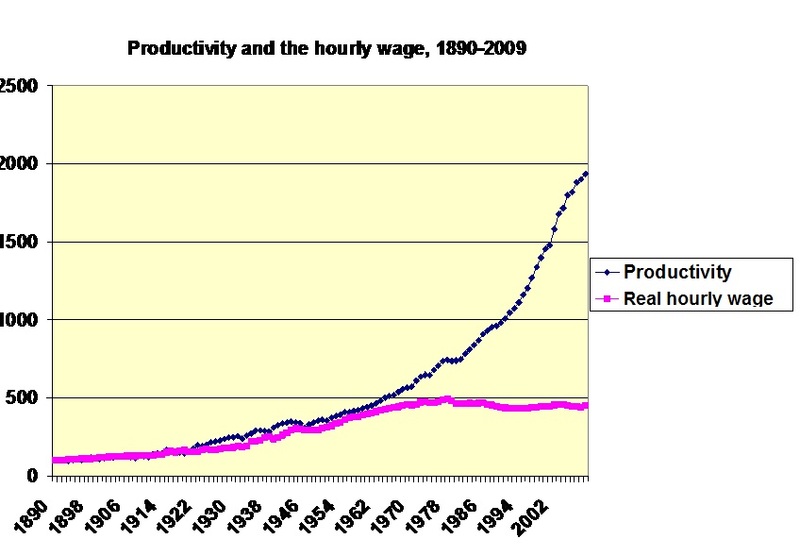 In Wolff's Marxian analysis, the gains in productivity have not accrued to the working class but rather to those at the top of the corporate structure --think of classical economists Adam Smith and David Ricardo and their proposition of labour theory of value-- hence the resulting inequality within the current American milieu. For Rajan, who is fundamentally a conservative economist if not necessarily a pure adherent to the freshwater school, it was the excesses in sub prime lending that was the final unsustainable band-aid that failed to deal with the reality of rising income inequality. He has forwarded the proposition that those in the middle and the bottom income groups continue to lose ground and it has been borrowing by those less successful groups that has permitted them to spend as if they were better off than they really were (hence the money illusion argument of actual rather than real wealth). 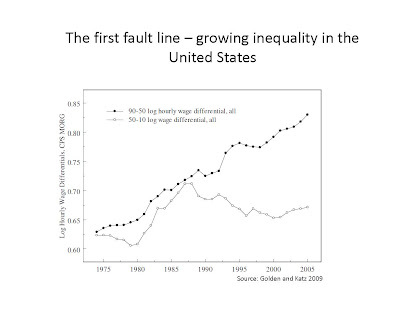 Short of a concerted and reasoned effort to deal with the root causes of inequality -- not an easy task by any means for any policy maker -- the only way for the American economy to grow at trend levels would be for the credit spigot to reopen. Given the current credit situation (Chart 9) and the future regulatory landscape that puts a greater premium upon the availability of liquidity and capital amongst financial institutions, the chances of this are slim. Banks recognize that growth will be from ultra high and high net worth clients -- whether they be in domestic or foreign markets -- not from bread and butter lending to the middle and working classes. 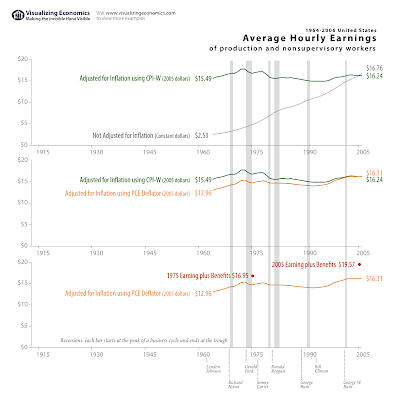 The following chart (Exhibit 8) shows the time series over three decades (1975-2005) and argues (based on a Minneapolis FED article) that worker's hourly earnings rose by 16% over that period; by any estimate this is a modest increase and would be lower in light of the downward pressure on wages in the last few years. The bottom left chart illustrates to what level consumer credit must return to if Americans (in aggregate) are to have the purchasing power of the past. There is no short term panacea for America to return to the growth profile of the past: granted, its entrepreneurial sector remains amongst the world's most vibrant and it will continue to be a magnet for the world's immigrants but the overhang of military over-reach, combined with the sclerotic manner in which politics in Washington is conducted -- solely for the lobbyists on K-street rather than the people on Main street -- means that observers, will continue to be spectacle to questions of Barack Obama's birth rather than a fundamental tackling of the serious issues that the country faces. I came across an intriguing graphic from Reuters this morning. Data taken from Thomson Reuters Datastream and a Reuters poll suggests that while the projected price of oil would drop slightly from it’s current price, it would remain high through 2013. But forecasts are fleeting; the level of crude was of less import than the fact that the projection maintained a spread between WTI and Brent -something that hitherto has been minimal. To my chagrin, I do not have access to a Reuters terminal so Bloomberg will have to do. 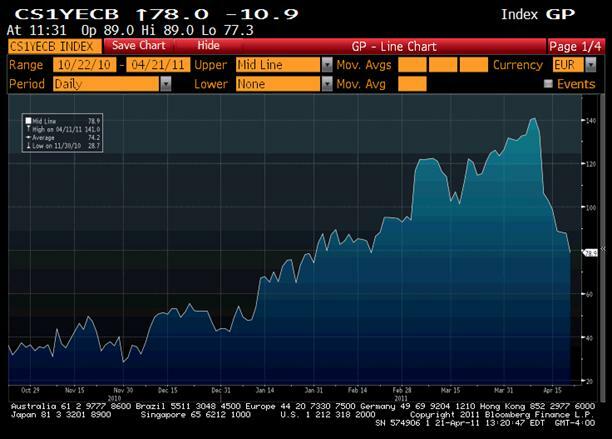 Here is the 1 year chart of the spread between WTI minus Brent (click on it to see in detail). Specifically, it is the ICE Futures Spread contract for the future month (ENM1COM1 Comdty is the Bloomberg ticker). Simply put, the maintenance of the spread by those polled implies that (at the very least) there would be no cessation of hostilities between the Libyan despot and the eclectic crew of rebels espousing some form of freedom and liberty. 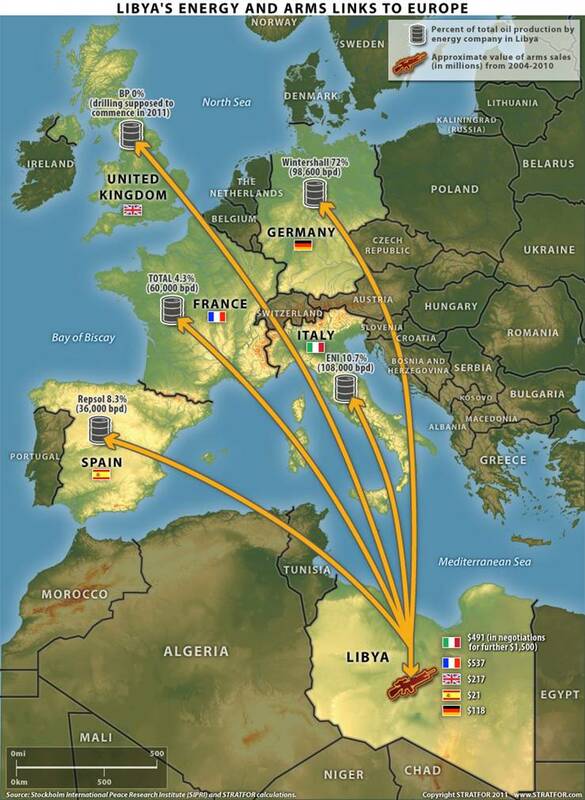 It is probably worthwhile to jog our memories about the geopolitical significance of Libya; Stratfor has an excellent graphic depicting the energy and arms linkages to Europe. Do you see the spread between WTI and Brent widening or narrowing in the future? Much would depend on your view of the timeline of civil war in Libya, the restoration of a functional supply infrastructure; the ability for the hypocritical House of Saud to talk down the price of crude while talking up Saudi Arabia's supposed ability to substitute for Libya's supply --a classic red herring as the two supplies are not interchangeable given the difference in grade-- and the general continuation of the Arab Spring. A previous post written on the heels of the European Central Bank's 25 basis point rate hike in the target refinancing rate posed the question pertaining to the ECB's conundrum: where would it go based on the sub optimal nature of its currency area? The argument forwarded, in a somewhat glib and matter of fact manner, rested on the notion that policy would have to be shaped by the core, specifically Germany, and the periphery -- known derisively as the PIGS -- be damned. For one, the dealer rates desks have recognized that rate hikes that were formerly baked into the cards, are no longer a sure bet. After the hike and amid the revelations of further challenges surrounding the sovereign debt situations in Portugal, Greece, and speculation concerning Spain, market expectations of future hikes have plummeted. There is now the tug of war between an strong core and a weak and worsening periphery as well as a circumspect banking system that is inappropriately capitalized to shape market expectations. When we say Germany is the "economic engine" of Europe, what do we mean? Despite the growth in Eurozone membership, Germany still accounts for almost 30% of nominal GDP of the Eurozone. 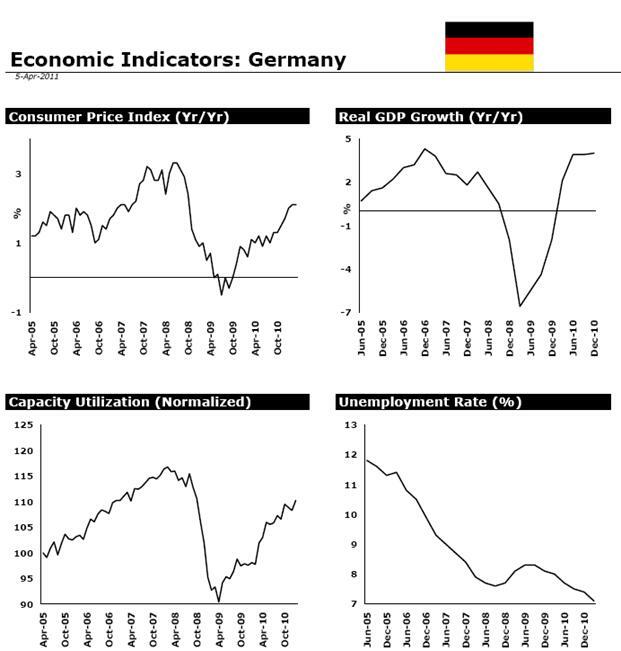 How Germany goes, so goes the Eurozone? Why is Germany's unemployment situation better than the rest of Europe? 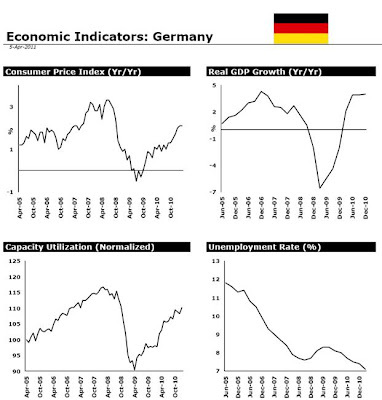 German labour did the heavy lifting in terms of sacrifices during the 1990s as the structural adjustment of abandoning the deutschmark took its toll on the German economy, and particularly the workforce. Upon reflection, the higher productivity of the German workforce, the time sharing activity during the slowdown, and the global demand for a range of goods from the industrial sector -- where Germans SMEs specialize and dominate -- to consumer durables -- where the global market's well heeled and the nouveau riche consumers demand the prestigious brands synonymous with quality and reliability -- have been amongst the factors for the low German unemployment rate. 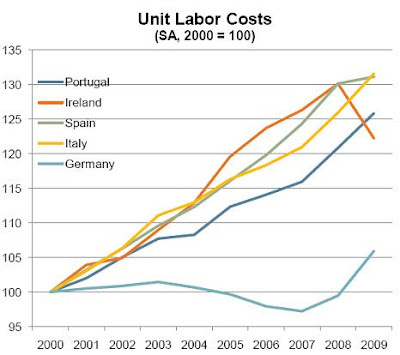 What the chart below illustrates is the fact that German unit labour costs have risen far more slowly during the past decade than those of the peripheral nations --Portugal, Ireland, Italy, Spain. 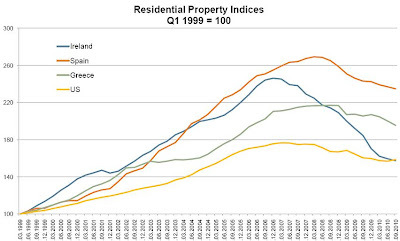 The sub-optimal nature of ECB monetary policy (on the one hand) and the fiscal irresponsibility of member states who were ostensibly bound by a toothless and meaningless growth and stability pact is laid bare for all to witness in the aftermath of the Great Recession: consider the real estate asset bubble and its aftermath. 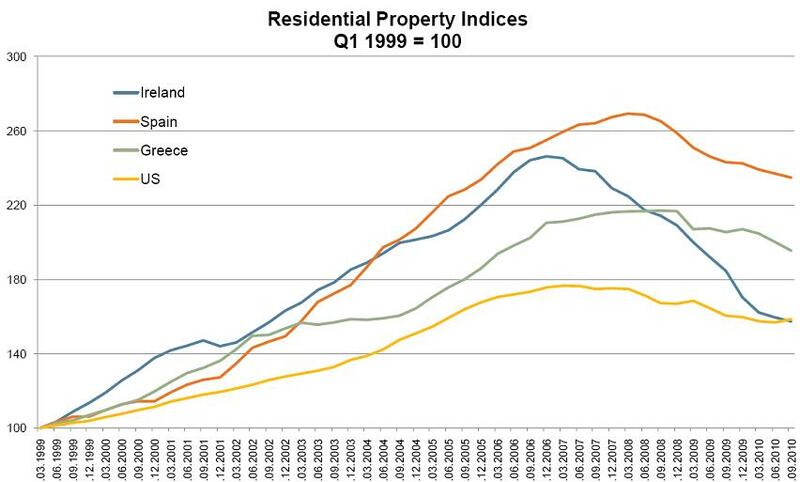 Spain's real estate bubble in particular has dwarfed that of the United States but Ireland and Greece went on similar runs with central bank policy rates that were far too low. 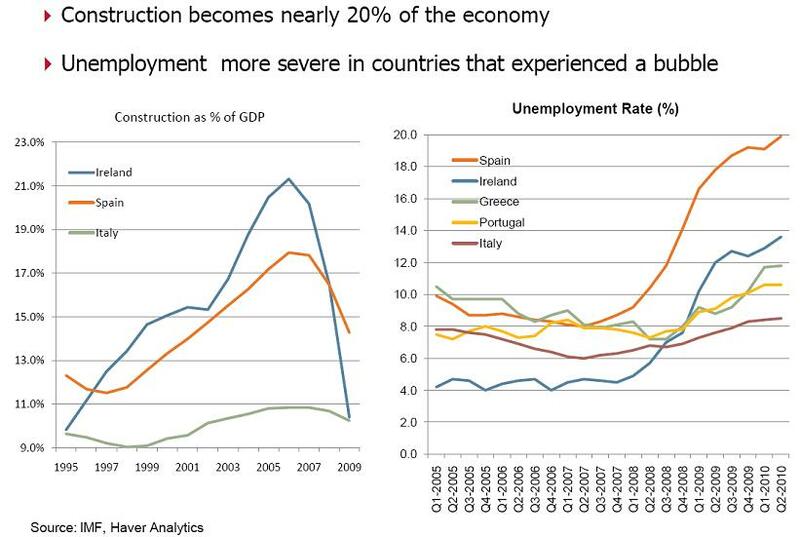 What does the future hold for the peripheral Eurozone economies that had the great asset busts? 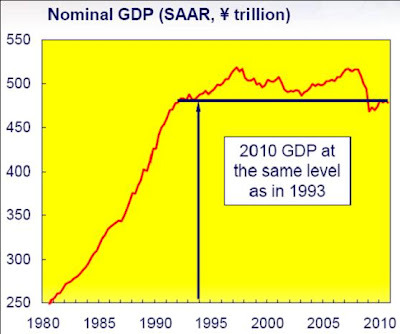 Consider Japan (see chart of Nominal GDP below); the "lost decades" scenario is far more likely to play out in Spain and Ireland but with a twist as every country has a different story: expect a never ending dose of disinflation bordering on deflation peppered with supply commodity supply shocks induced by the demand in the developing world. Portugal's problems -- low productivity and high factor costs combined with an unsustainable fiscal situation -- also leave it in a potentially deflationary lurch. With the recent record nominal highs in silver and gold, this view may appear heretical but remember that in the absence of a flexible exchange rate -- something that Portuguese and Italian governments past have relied on to remain competitiveness through implicit devaluation -- the PIGS, namely Portugal, Ireland, Greece and Spain will have to adjust by lowering costs. 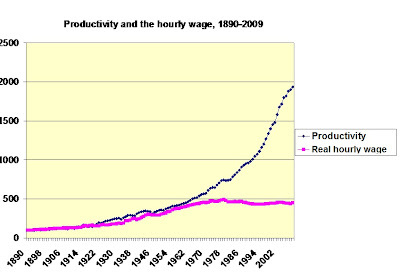 The supply shocks of ever increasing commodity and fuel costs will give the impression of inflation but within the peripheral nations the working and middle classes will simply not have the power to negotiate rises in wages or salaries given the far greater than long term average unemployment rate combined with the necessity of policy tailored to a booming German engine. There will be no wage push inflation; there will be no second round effects -- inflation will be transitory, disinflation will become embedded, while there will be price stability for the core. Could all of this have been avoided at the policy level? the industrial structure in all member countries is diversified. In the EU, of the 15 intra-union trade is quite high. The industrial structure is diversified and quite similar in most of the member states, with Ireland, Portugal and perhaps even more so Greece the exceptions. Charts of unit labour costs and asset bubbles from Peter Hall (VP & Chief Economist, EDC) presentation: Euro Crisis: Is The Global Economy At Risk? Today's inflation release from Statistics Canada created a flurry of activity in the F/X markets with the Canadian dollar (the "loonie") advancing the most in relation to the US greenback in two months and spurring speculation of the Bank of Canada ("BOC") moving forward with expected rate hikes from July 17 to May 31. This is unlikely. The arcane world of central banking and monetary economics is replete with references to output gaps, terms of trade, nominal anchors, projection horizons, and base case scenarios. It is generally agreed that inflation is a real and tangible phenomenon in countries not having to contend with massive devaluations in real property in the aftermath of the Great Recession -- I am referring specifically to OECD nations here, such as Spain whose crash dwarfed that of the United States -- and the resulting commodity demand stemming from development in China (primarily) and other nations. Consider that some central banks -- namely the European Central Bank -- are taking preemptive action to stave off nascent inflationary embers, whilst others -- think of those in the emerging market and BRIC economies such as the Reserve Bank of India -- have been decidedly behind the curve and risk exerting further hardship on their impoverished underclass. This should not detract from the assertion that the BOC will hold off until July. Consider two points and decide which, if any, are feasible. The chart above tracks the "real" BOC overnight rate (based on the Fischer equation) along with core inflation (ostensibly the BOC's nominal anchor) and a three-month moving average of the CPI to strip out noise from monthly releases. It shows that -- in keeping with the BOC's assertion -- monetary policy remains very accommodate. augmented based on the strength of the loonie to predict that a July hike remains on the cards. Furthermore, readers should consider that central bankers are generally a conservative lot; it is highly unlikely that a rate hike catalyst will be the higher than expected monthly inflation figure. Sings of inflation would have to be persistent and pervasive and the current fluid geopolitical situation in Northern Africa combined with the uncertainty surrounding Eurozone peripheral sovereign debt and health of the European banking sector (be it in terms of capitalization or quality based on a rules or macro prudential framework) leaves the notion of an earlier than expected hike as dubious. Having said this, there is absolutely no doubt that the erudite scholars of the Monetary Policy Council at Canada's preeminent economic think tank will be urging for a 25bp hike -- as they have been doing since the beginning of 2011. 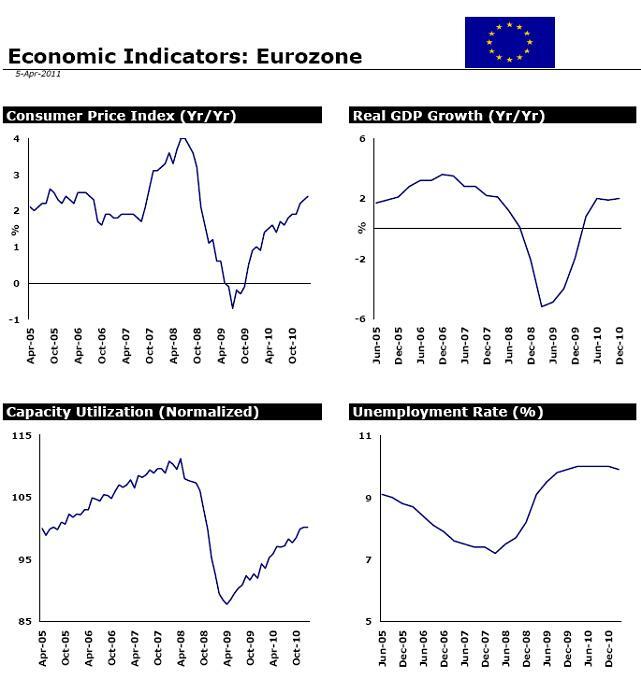 ECB President Jean-Claude Trichet turned markets on their heads on March 3 by transforming what was expected to an inconsequential meeting – in terms of ECB future policy guidance – into a clearly articulated statement of an impending rate hike in April (see chart below). This was ostensibly a signal that the ECB would be willing to act now in order to stave off potential second round effects of the commodity induced inflation that is prevalent in the developing markets and slowly but pervasively seeping into developed markets through a higher cost of living in terms of everyday goods (and often excluded from the so-called “core” items used as a nominal anchor by central banks for inflation targeting). Trichet kept to his word (and maintained a modicum of credibility); the swap markets have factored in 75bp in terms of tightening for the remainder of 2011. Your scribe is betting that the ECB will defer to the Teutonic influence and set rates for Germany's benefit and quell inflation with the political quid pro quo that Bundesrepublik Deutschland will compensate peripheral states suffering from credit downgrades, fiscal austerity and grinding disinflation due to inappropriate monetary policy. The political cost will be high for Frau Merkel but a necessary evil in the absence of a formalized fiscal transfer mechanism; the EFSF morphing into the ESM with putative governance of sovereign nations' fiscal spending plans is nothing but political legerdemain but the intelligent yet removed bureaucrats in Brussels. The Euro is not going anywhere – the tales of its demise have been exaggerated – as it is the currency equivalent of a dysfunctional family who will stay together for the sake of the greater good. Under this analogy the US greenback would be the materially successful uncle with a serious substance abuse debt problem not wanting to get into a 12-step program and unwilling to make the difficult decision to take the first step. Optimal currency area is dead; long live the suboptimal currency area.